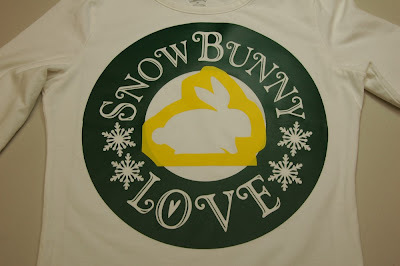 Crafty Gift Saturday: Tee Time!! 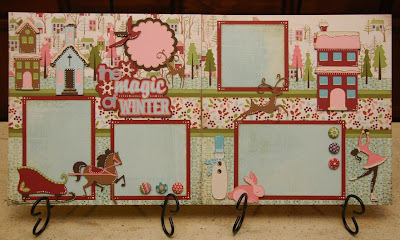 Winter Magic Kit - NEW! Back in Stock - Wild About You Kits!!! And here it is Saturday - the final day of my Guest Designer week with the Christmas with the Cricut Blog HERE. It's been an absolute honor and pleasure getting to show you my designs this week, and I must say that all of your comments and support have absolutely warmed my heart and made it all worth it. Hugs to you all!!!! And a huge thanks to Joy, Tammy and Melanie at CWTC - you ladies are incredible, and I can't tell you how much I've enjoyed this! And to my fellow Guest Designer, Mandy, you are one seriously talented lady. Thanks for sharing your work this week - your designs have been so creative and gorgeous!! 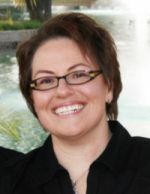 Be sure to check out Mandy's blog HERE. One of my absolute favorite things to do with my Cricut is to make T-shirts. Yes, really. I know a lot of people have used the freezer paper method, but I once read of someone trying out vinyl, so I gave that a shot, and I feel like it works WAY better than freezer paper! 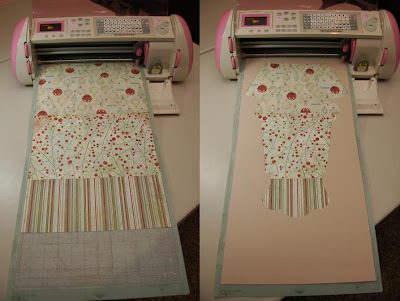 Plus you don't have to iron anything, and you don't have to worry about trying to flip your image since you have to flip freezer paper when you iron it on, but you don't have to flip vinyl! So I think that vinyl ROCKS!!!! And btw, I get all of my vinyl HERE. They have the best prices I've found, super fast and cheap shipping, and the same type of vinyl that PC sells - but loads of colors to choose from. First of all, I used Design Studio to layout this design. You can try downloading the cut file HERE. I should point out, though, that some of my cuts I used the "Hide countour" feature, and I do believe that when you save and share a file, those hidden contour lines will show up again, so you'll probably need to go and make them disappear for you before cutting. But even if you don't use my design, these basic steps will certainly work for your own, so have fun! Here's a picture of all the vinyl pieces I used. Most are stencils with the pieces weeded out so I can paint in them. I first applied this yellow circle as a place holder. It's just a guide to help me get my circle title positioned right. To apply your vinyl, use transfer tape (clear contact paper works great!) over your image, then peel off the vinyl's backing and stick your image down. 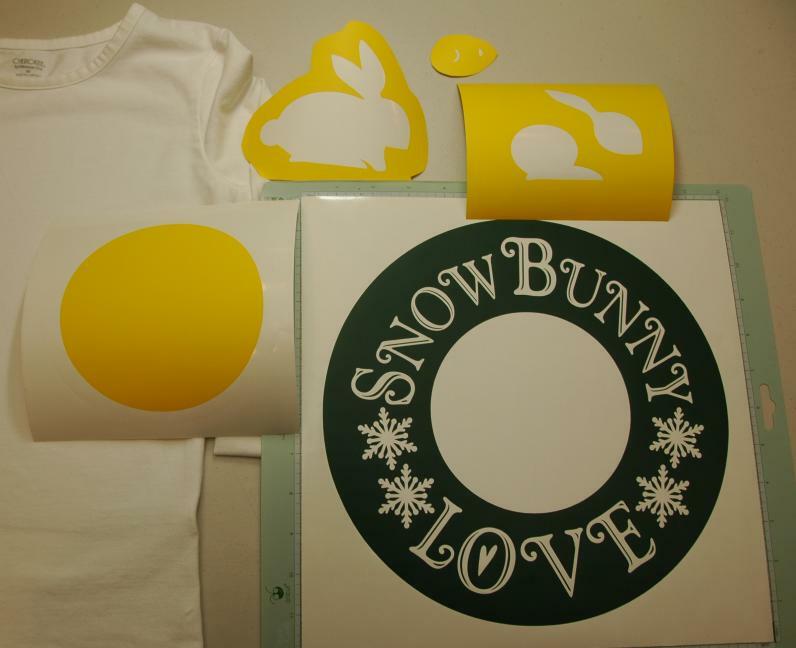 Use a vinyl application tool to go over the image and remove the transfer tape. Then press the vinyl down even better with your fingertips. Because my title stencil is so huge, I cut it in half and then applied it with transfer tape. Vinyl is different than paper in that the bigger the vinyl, the harder it is to work with. Smaller is easier! I then added the rest of the title stencil. 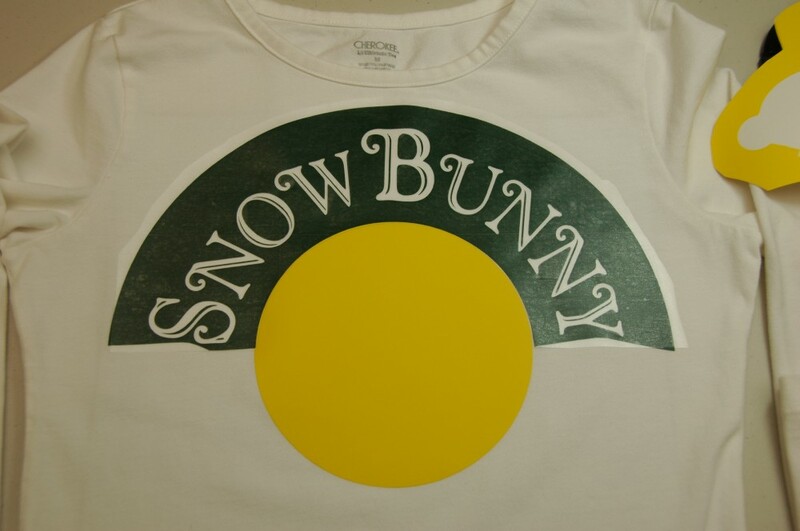 then I removed the yellow inner circle and added the bunny stencil. Time for paint! I use Jacquard brand fabric paint that I purchased at JoAnn's. They make several metallic colors which are such fun! I painted purple inside of the bunny stencil and the title - but not the snowflakes or heart just yet. Helpful TIPS: Don't apply paint too thick or it'll seep under your vinyl. After first coat, use a heat embossing gun to dry the paint for a minute, holding it 6" away and moving it around. Then apply a second coat. One coat just doesn't seem to hold up well. 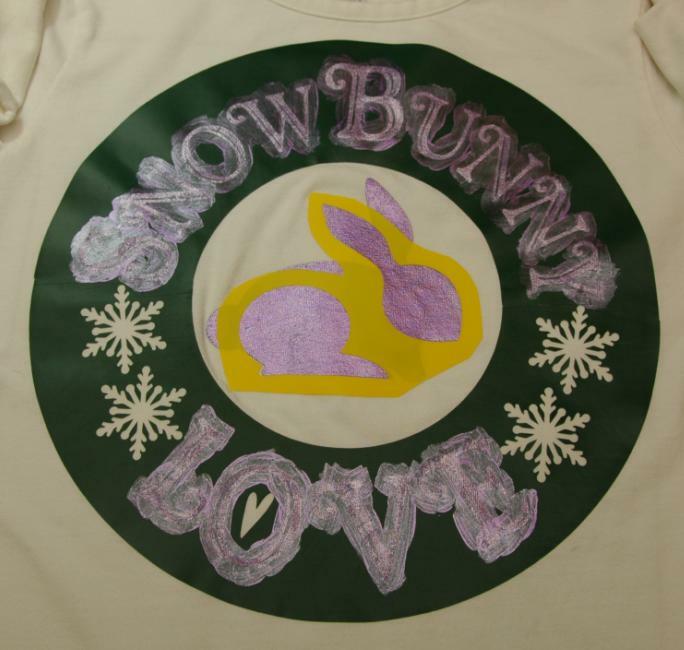 After my 2nd coat on the bunny was dry, I removed the stencil and added the next stencil for the other layer. 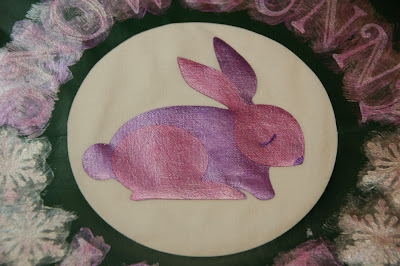 I then painted this layer pink - again 2 coats and dried both coats with a heat embossing gun. Here's what the cute bunny looks like at this stage. Next, I added the eye/nose stencil to the bunny's face and painted a slightly darker purple here. I also went back over the title with a swirled blend of purple, pink and silver paint. 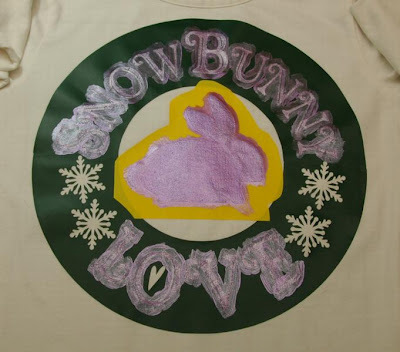 Then I painted the snowflakes silver, with a hit of pink swirled in, and also painted the heart a bright pink. 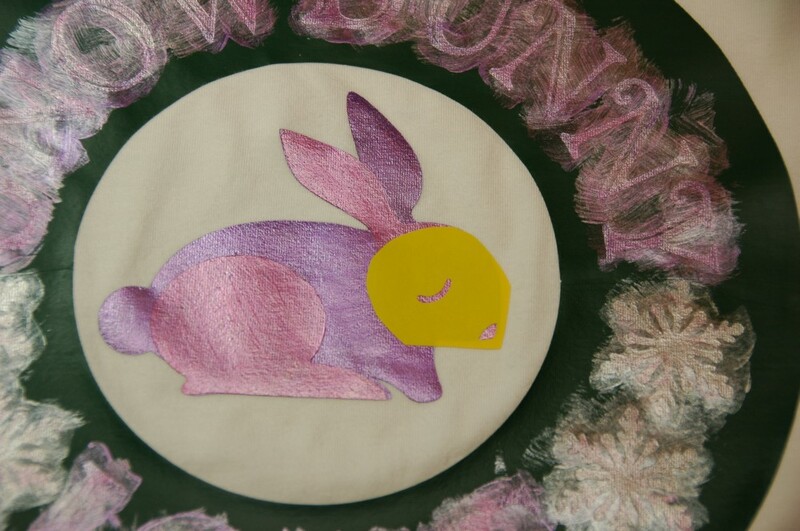 Here's a close-up of the almost finished bunny. Isn't he just adorable? Next, after all of your paint is dry, go ahead and remove all of your vinyl carefully. Keep in mind that as you pull it away from your shirt, you can use your scissors to cut off the vinyl pieces to make it easier to handle. 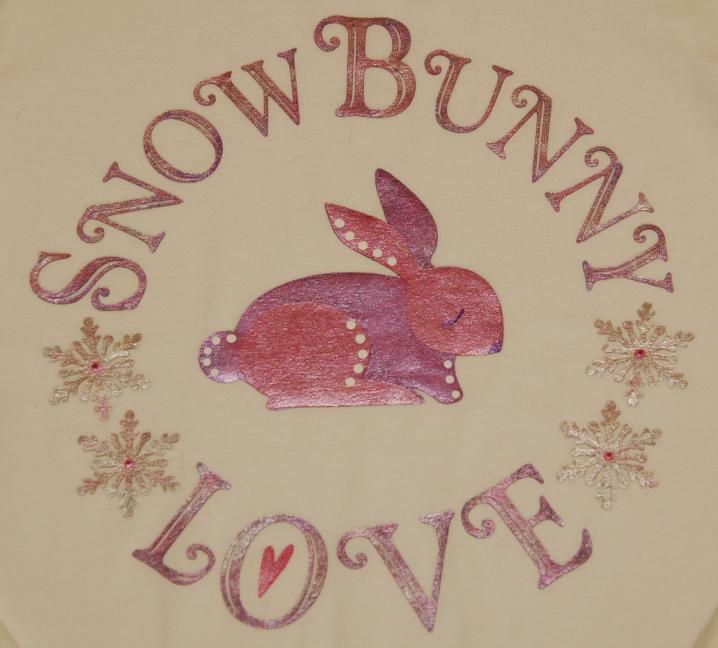 Finally, I used the BACK TIP of my paintbrush to add a bright pink dot to the center of each snowflake, and then also added white dots to the bunny, and dried them with my heat embossing gun. Ta-da!!!! You'll need to let your t-shirt cure for at least 24 hours, and then heat-set it with an iron on the highest heat that your shirt can handle, putting a cloth inbetween the image and your iron. Wash as you normally would, and hang to dry. How fun is that? Thanks again for following my blog this week. I hope you had a blast and maybe even picked up a helpful tip or two. Happy Holidays!!! Welcome to Friday! I hope you all had a fantastic Thanksgiving! We sure did, and even got to run and buy some irresistible cartridges at M's tonight. And I'm going back out into the madness in just a few hours after my nap tonight, hehe. 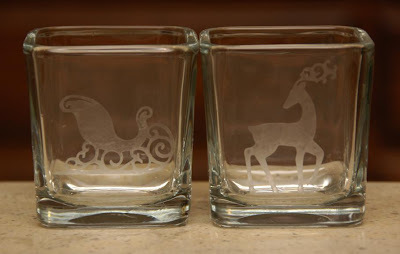 As you know, this week I am a Guest Designer for the Christmas with the Cricut Blog HERE. Make sure you check it out and leave a comment to have a chance at winning some cartridges. 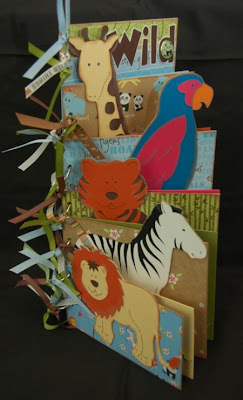 Also stop by Mandy's blog HERE and see what adorable card she has created. I decided to make a "gate fold" card since I haven't done one in a couple of years. 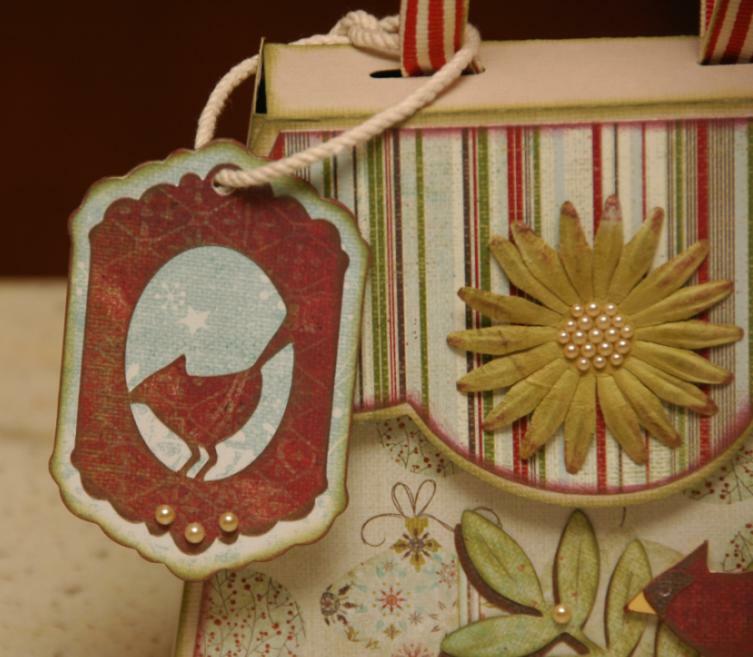 They are such fun and offer extra little places to decorate and embellish - perfect for a fancy card, right? So here's the basics of what I did. Since I'm obsessed with my long 12x24 cardstock (this color only available through OhMyCrafts), I used a piece of brown and cut a strip that's 5" x 14". I then left the center piece at 5" x 7" and folded the 2 flap pieces inward. 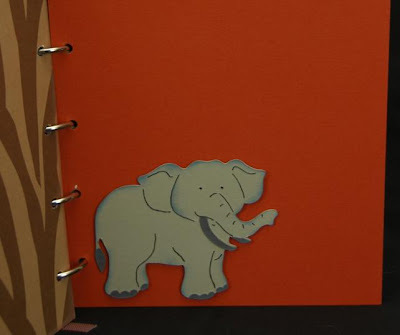 (You can still make this type of card without the long cardstock - either make it a little smaller, or piece it together and have a seam in the back.) 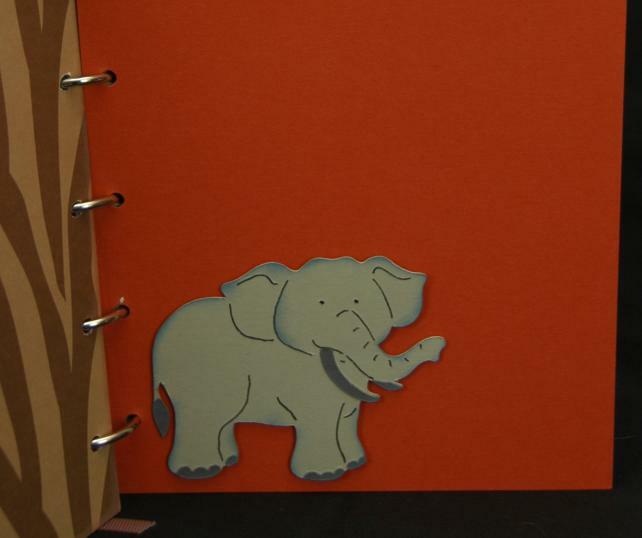 All of the other papers are from My Mind's Eye, and a couple of small cuts of SU solid cardstock. I cut various pieces of the MME papers to cover the flaps inside and out, and the middle area as well. I did loads of layering and inking, and attached 2 Karen Foster brads to the outside flaps for a closure. 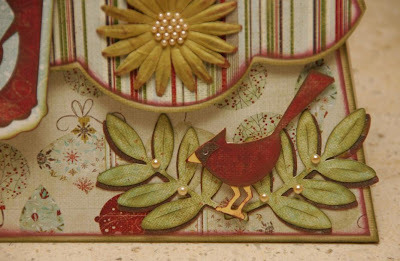 On the inside left flap, I created a gift card holder by cutting a piece of patterned paper, and using a SU 1 1/4" circle punch to punch a notch in it, then glued that paper on 3 sides as a pocket. Don't forget the yummy Starbucks card! On the inside right flap, I needed a place to write a sentiment, so I made sort of a card within the card. This way I could still decorate the front of this mini card and still have plenty of space to write inside. 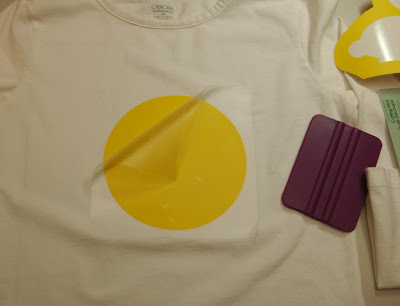 Here's the basic Cricut cuts I used. 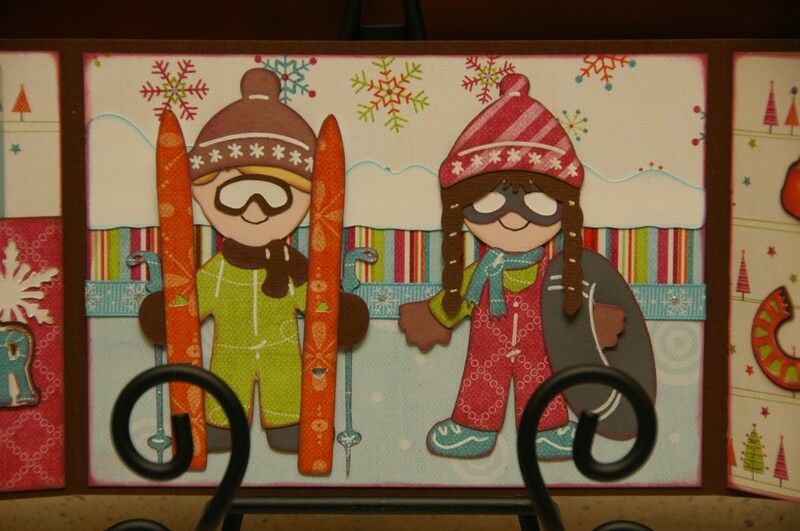 From Everyday Paper Dolls, I cut the snow kids and their gear all at 3 1/2". Aren't they just too cute? They make me want to go sledding! 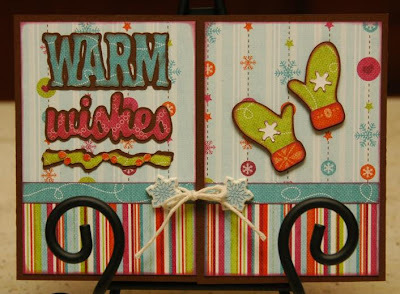 And from the Winter Woodland cartridge, I cut the Warm Wishes title at 2 3/4" (it's actually Warm "Winter" Wishes in the cart, but due to space, I removed the "Winter" part). Also from WW, the cap was cut at 2 1/4", the mittens and scarf at 2", snowflakes are 1 1/2", "Brrrr" is 1 1/4", and the tags to write the sentiment were cut at 4". This week is really flying by. I can't believe it's Thursday already - Happy Thanksgiving to all of you. I hope you have a warm and wonderful holiday with the people you love! 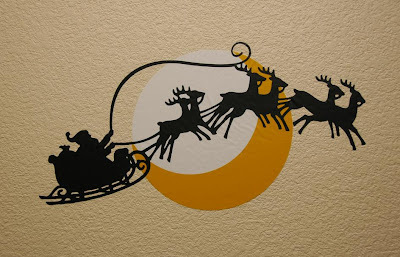 My week as Guest Designer for Christmas with the Cricut continues. Be sure to check out their amazing blog HERE every day for incredible Christmas ideas and awesome giveaways. They are a supremely talented bunch over there. Also be sure to pop in to Mandy's blog HERE as she is the other Guest Designer this week, and is hitting it out of the park every time!! One more quick note: Don't miss my blog post directly below this one as I am introducing my brand new Cricut kit "Winter Magic" which uses the Winter Woodland cartridge. Alrighty, let's get down to business, shall we? I went all out on this layout - maybe even a little overboard. But that's what happens when I get my hands on gorgeous paper. I can't help it!! This paper is by My Mind's Eye from their Wonderful Winter stack. It's glittery and just makes me feel all warm and cozy inside. I pieced together the background strips that go through the middle of the pages, and used lots of dark brown chalk ink all over the place. I also used the Stampin' Up! scallop border punch for the red strips. Btw, if you're going to try out this layout, there are many things you could easily simplify and still get the basic look and feel. You can ignore my ridiculous need to add too much detail. So I used both Winter Woodland and Everyday Paper Dolls on this layout, and I'll tell you the sizes that I used for the cuts. Here we go. 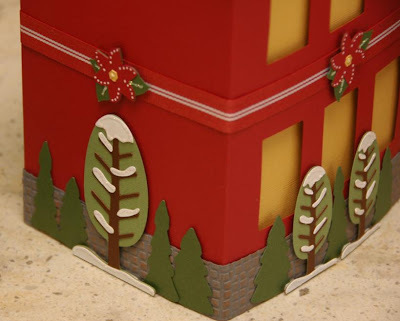 From Winter Woodland: The Building is 9 1/4", Trees are 3 3/4" and 4 1/4", "HOME" title is 2", "for the HOLIDAYS" title is 1 1/2", Bird is 1 1/4", Branch1 on left page is 2 1/2", Branch2 on right page is 1 3/4", Poinsettias are 1 3/4", Snowman is 3 1/2", Squirrel is 1 1/2" flipped. Obscenely tiny holly leaves to make wreath are 1/2". Snowflakes are 1 1/4", 1 1/2" and 1 3/4". From Everyday Paper Dolls: Airplane is 2", Car is 3 1/2", Suitcases are cut at 3 1/2" and 3", Dog is 1 1/4". This cartridge doesn't actually offer layers for the airplane and car - no shadow, no nothing. So what I did is cut the airplane out in several different colors, and cut away the different parts that I wanted in different colors and layered them on top of the light blue base. I also cut the plane in red and off-set that underneath to make it look like a shadow. I used this same basic process for the car, but without the shadow. A few little details: I Cuttlebugged the house with the Tiny Mosaics folder and then lightly inked the texture. The cardstock I used for the base of the house, which is the yellow that shows in the windows is by Core'dinations, and I sanded it down a bit to make more of the yellow show through the whitewash for a soft, glowy look. To create the wreath on the door (I can't believe there's no wreath in the WW cart! ), I cut super tiny holly leaves in green and ice blue, inked them and glued them onto a letter "o" (you may need tweezers and a microscope if you want to try this). Then the tiny bow was cut off of the baby's bonnet on the Everyday Paper Dolls cart. 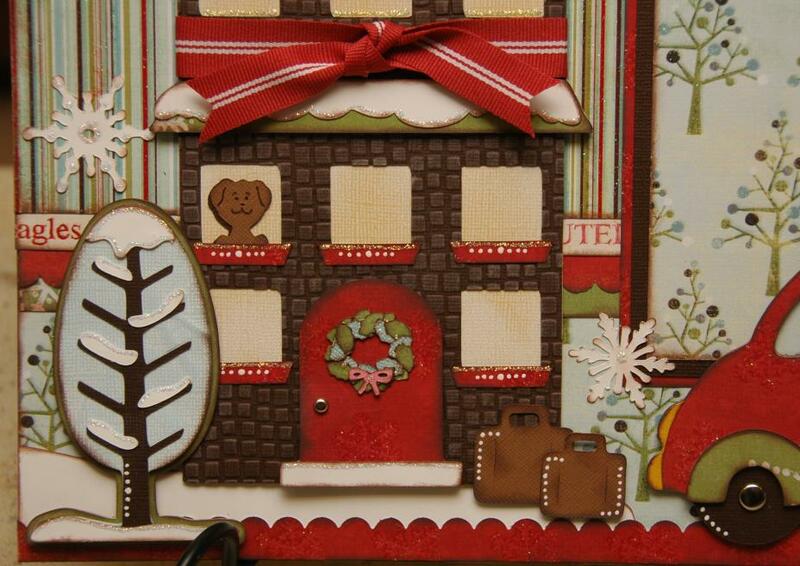 Also, I used lots of chipboard and pop-dots here and there because I'm obsessed with dimension. 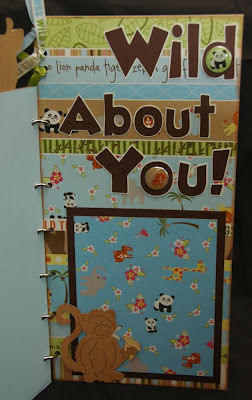 My scrapbook may not close with this layout inside, LOL! 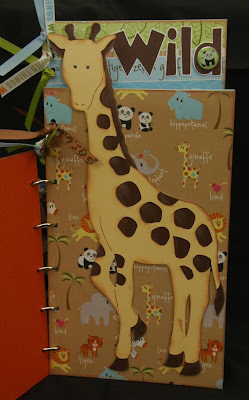 The ribbon I used is from Stampin' Up, and I also added lots of Diamond Stickles and white dots. 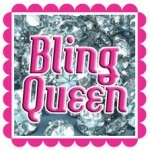 Bling, bling! I sure hope you're enjoying my projects this week. I've really had fun reading over your sweet comments! Thanks for letting me share my work with you!! 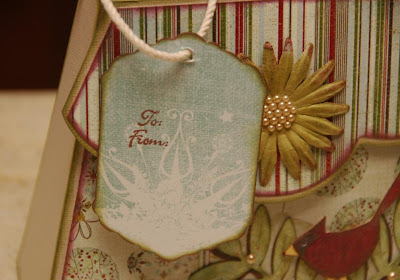 Be sure to check back tomorrow as I've got a very special card for Fancy Card Friday. My mom is already trying to get me to sell it to her. Yeah, right - nice try, Mom! ;) Happy Holidays!! 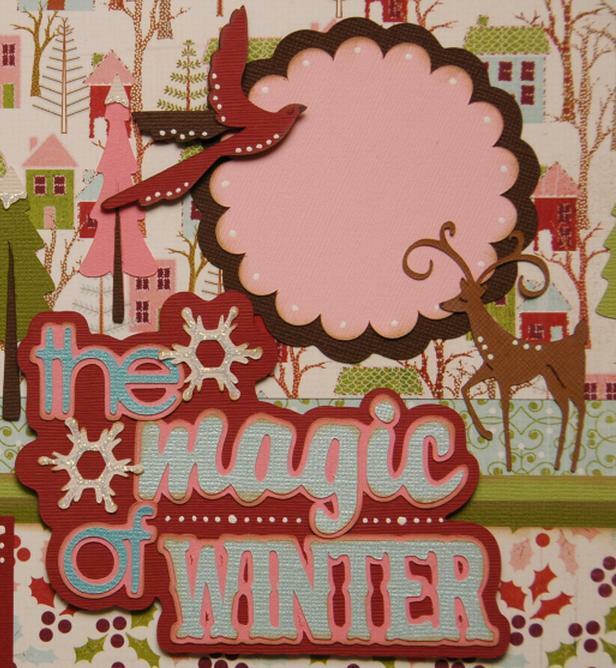 It's finally time to introduce my brand new Cricut kit - "Winter Magic". I am so excited about this kit, and wouldn't mind spending a day living in it. Aaaaah, wouldn't that just be a dream? If you've never ordered a kit from me, here's the scoop. Your kit will include all of the papers, cardstock and other materials (like these gorgeous Basic Grey brads!) that you'll need to complete the layout. You'll also get my very detailed yet easy to follow directions with my Cricut Cut Chart (like the one I posted the link for with Tuesday's project). This chart shows you line by line exactly what you need to cut with all of the settings. Plus cuts are grouped by color so it's very efficient. And there are also well-organized written instructions as well as plenty of color photographs. I don't mess around! Here's what YOU will need to complete the kit as shown: Cricut Expression or Create, Winter Woodland cartridge, Diamond or other clear Stickles, tan or brown chalk ink, 3D pop-dots, white gel pen (Signo Uniball is best), brown marker, Crop-a-dile or other hole punch for brads, plus basic tools and adhesive. UPDATE: These kits are temporarily sold out. I should have more around the middle of December or so. Please email me if you'd like to be on the waiting list. These kits are being produced in 2 rounds. A 10 hour head start to my current clients nearly wiped them out, but I do still have a few left that are available to ship early next week. The second round will be available to ship in about 3 weeks. I do require payment to reserve your kit, and can accept PayPal, check or money orders. Kits are $25. If you're in my area, you're welcome to pick up your kit here. Otherwise, shipping in California is $5, and then outiside of CA it will range between $6 to $8, depending on your location. To order a kit, or if you have questions, please email me at moniquegriffith@yahoo.com and include your zip code or state so I can figure out your total with shipping. Happy Thanksgiving and Merry Christmas!!! 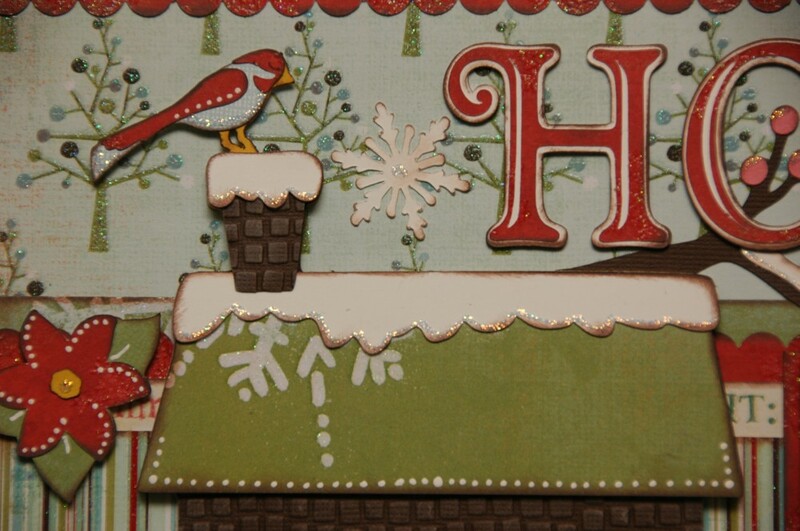 So by now you know that this is my week as Guest Designer for the Christmas with the Cricut Blog. Make sure you're checking it out HERE each day because they are giving away some awesome prizes, and I don't want you to miss your chance! Also, check out the incredible Mandy Ferg's blog HERE. Her project today is amazing! As for my project today, I have created a vintage kelly bag style purse. I used the Tags, Bags, Boxes & More cartridge to create the purse itself. To make it as large as possible, I used a 12x24 mat along with 12x24 "Twig" colored cardstock. Recently I stocked up on this gorgeous Bazzill 12x24 cardstock, so yes, I'm going a little crazy with it. Btw, you can get this cardstock *only* through OhMyCrafts.com. Provo Craft also makes this size cardstock, but not in the softer tones and neutrals that I like. Anyway, I cut my purse using the Fit to Page button (make sure you've hit the Mat Size button so your machine knows you have a long mat), and that wound up cutting at 11 1/2". 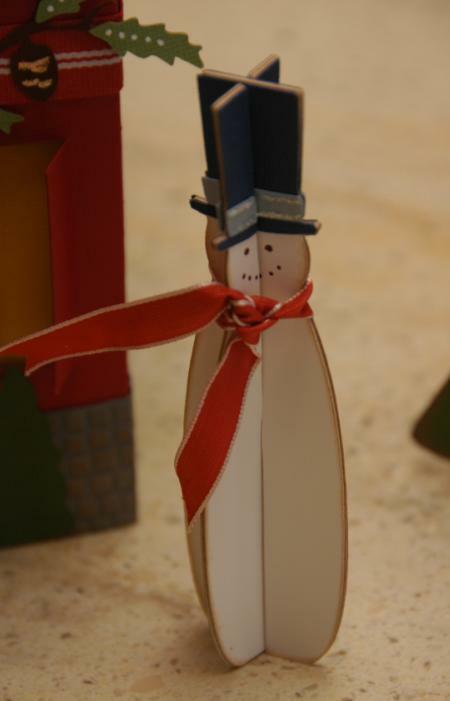 When folded, the whole bag measures 9" tall to the top of the ribbon handle. After I cut out the Twig colored purse, I saved the negative to help me out with my next step. I wanted to use some patterned papers to cover the purse, but didn't have any that were 12x24. Plus I wanted to mix them up a bit! So using my negative cut as a guide, I cut some strips of different patterned papers (from Fancy Pants - aren't they delicious?) and put them on my long mat together. I measured them so that where the seams meet up, it's at sections I didn't need to use - such as the bottom section of the purse. Check out the pic below to see how I laid them out, and then also you can see how they line up under my template. After I cut the patterned purse pieces, I drew a pencil line where I would normally score the bag. Then I used my paper trimmer to cut out the panels I wanted. Once I had my pieces, I then trimmed an extra 1/8" off of each side so that these patterned panels would be inset from the purse itself. I inked the patterned papers with red ink, and used green ink on the edges of the purse itself, and then attached the patterned panels. From the Everyday Paper Dolls cartridge (pg 69), I cut the leaves at 2" in both green and brown. I did one set regular, and also cut one set flipped. I inked the green leaves and layered them off-set onto the brown leaves and attached to the purse. The adorable cardinal is from the Winter Woodland cartridge (pg 59). I cut this at 2 1/2" including the different layers, inked it and used pop-dots to attach. Then I just felt the need for some festive berries, and thought these pearls would give it an interesting touch. And to coordinate, I also added tiny pearls to the center of the green flower on the flap. This was pretty tedious, even with my neurosurgeon-like dexterity. The perfectly coordinating cardinal tag is from the same page in Winter Woodland. Using the Tag feature, I cut the red part out at 3". I then added the shift button to cut the solid tag in blue (also at 3"), and did the same tag with the flip button on so that I could perfectly back the tag as well. I inked the pieces, added pearls and a rope cord, and added a To/From stamp to the back. For the finishing touches, I used SU's striped ribbon for the handle and tied the ends underneath, and then added a velcro dot to the flap as a closure. This bag would be perfect for any (light-weight) small gift such as a gloves or a scarf, or even some fun crafty items. Be sure to tune in tomorrow - same time, same channel. I'll be showing you my very detailed 2 page layout - AND - in addition, I'm also going to be introducing a BRAND NEW KIT!!!! It's a 2 page layout that uses the Winter Woodland cartridge, and it's packed with whimsical little details! Plus with the kit, you'll get my full directions with my Cricut Cut Chart like the one you got to download from yesterday's post. I'll have a very limited number of kits available, and am more than happy to ship. So check back tomorrow - I can hardly wait to show you!!!! Welcome to Home Decor Tuesday! 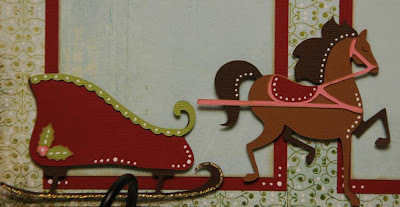 This is my week as Guest Designer for the Christmas with the Cricut BLOG. Be sure to check it out as there are some mind-blowing projects and tons of giveaways! Also, don't miss Mandy Ferg's BLOG this week as she is super duper talented and will be posting each day as well. Alrighty, here's a project entirely from the Winter Woodland cartridge. Even before this cart came out, I was dying to get my hands on it so I could make one of these amazing 3D buildings. For very complete directions click HERE. This will take you to my pdf file of my *full* directions, which will also show you the type of directions that I include with ALL of my classes and kits. (If it's not working, email me at moniquegriffith@yahoo.com and I'd be happy to send you the file.) This is 4 pages, and includes my Cricut Cut Chart, which shows you line by line exactly what you need to cut on your machine - and all cuts are grouped by color so it's nice and efficient. Hope you enjoy this special peek at my directions!!! 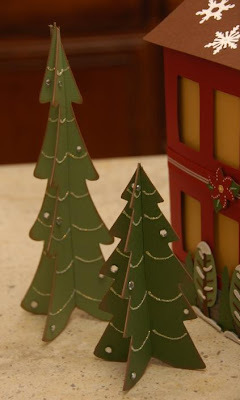 Here's the basics of how I created this cozy little Christmas house. I used 12x24 Bazzill cardstock (the "Preppy" collection). 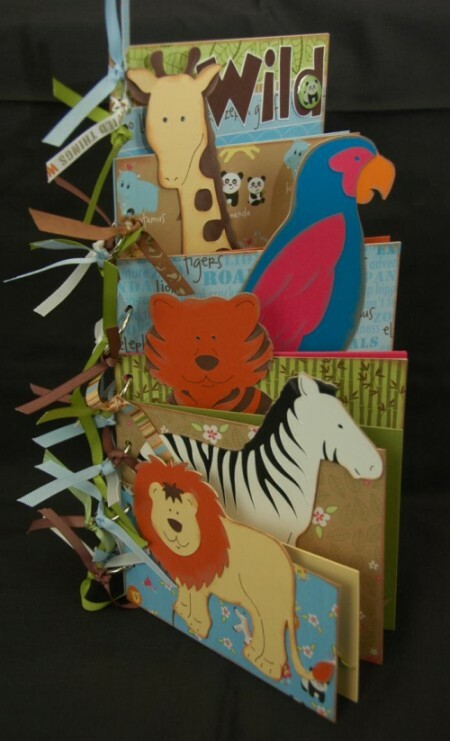 The 12x24 Bazzill cardstock is exclusive to OhMyCrafts.com, and it's gorgeous. So I cut out the house on page 75 of the booklet, and then referred to pages 82-85 for a visual on how to score, fold and assemble it. Btw, this house is pretty good-sized. It stands 11" tall at the height of the chimney (and it's going to look so dang cute on my fireplace mantle!). I cut a couple of gray strips and ran them through my Cuttlebug with the Tiny Mosaics folder to make them look like a brick border. 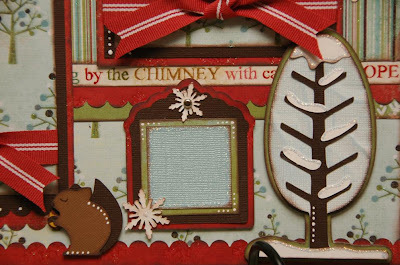 I added some trees around this border as well as the cute bunny. Then I wrapped a piece of ribbon around the middle section. I added some branches to the front on top of the ribbon, and then added a poinsettia on each of the 4 sides - also on top of the ribbon. Well, I just had to add a monogram "G" to make it my own - how fun is that? And then I added snow and snowflakes to the roof and chimney. The 3D trees are from pages 72-73 in your booklet. You can certainly make them out of a single layer of heavy cardstock, but I wasn't having much luck getting mine to stay put this way. I had to yell "Timber!!!" too many times, so I decided to make them out of chipboard first and then sandwich the chipboard between layers of green cardstock. I had to widen the slits of the trees just a tiny bit, but now they're nice and sturdy and don't fall over. I did the same with the 3D snowman too. If you know me, you know I'm all about the details! So of course I had to go and add lots of Stickles (Diamond color), rhinestons to the trees, and some little accents with my trusty Signo Uniball white gel pen. 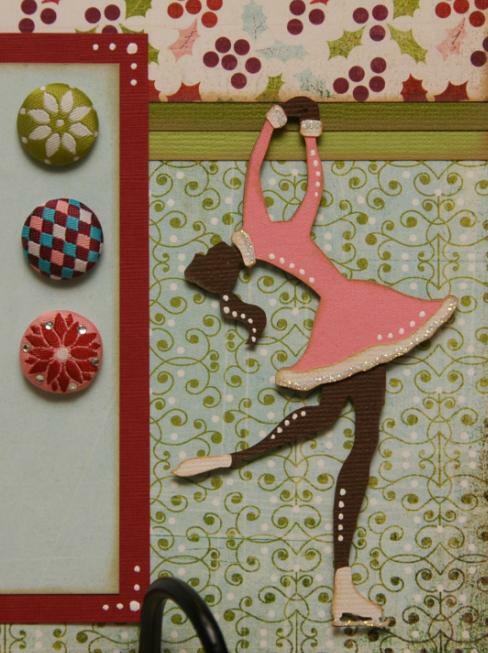 You could really go nuts with the embellishing and make it extra fabulous! Thanks for stopping by. 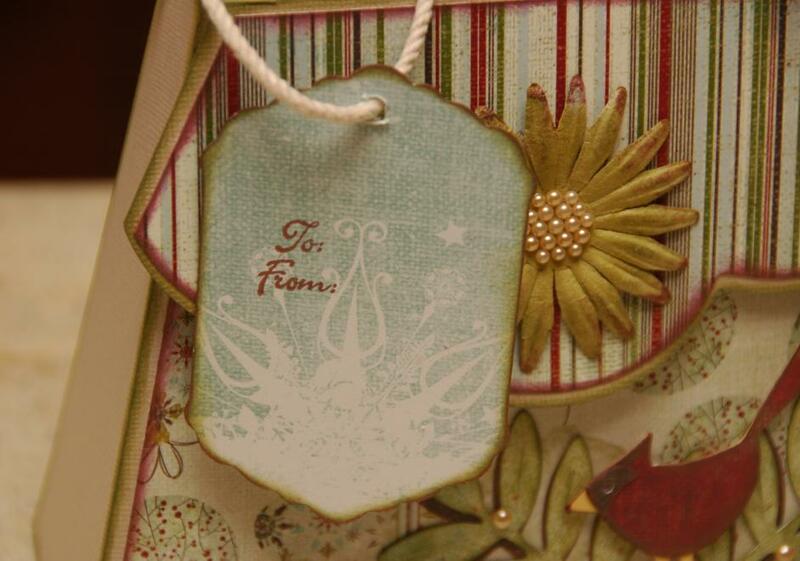 Be sure to tune in tomorrow for my elegant Gift Packaging project. Oh, and thank you to all of you for posting such nice comments on yesterday's project. I couldn't believe you all liked my video so much. Maybe I'll do another one someday! 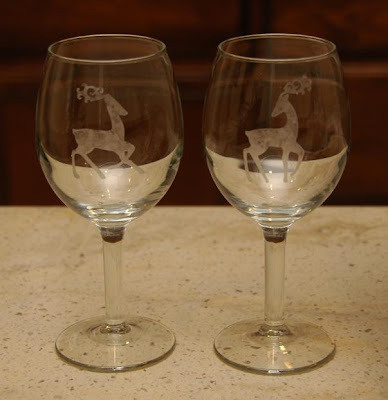 Christmas with the Cricut Guest Designer Week Begins!!! Happy Monday! What an exciting week this will be for me and my devoted Pink Expression. I have the honor of being a Guest Designer this week for the Christmas with the Cricut blog, which you can check out HERE for a wealth of creative Christmas ideas and some incredible giveaways this week! A huge thank you to Tammy, Melanie and Joy for selecting me, and for everything these talented ladies do!! Also, the other Guest Designer for the week is the insanely talented Mandy Ferg, so be sure to stop by her BLOG as well. Welcome to Simple Card Monday! And there's even a video below! If you know me very well, you just might know that I have a tough time keeping things "simple". So this card is about as simple as I could get. 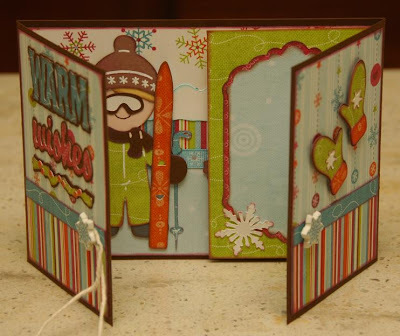 I used the Winter Woodland and Everyday Paper Dolls cartridges, and that's what I'll be using throughout the week. Wow - talk about 2 amazing cartridges! I'm trying not to drool on my keyboard here! To make this card, start with a horizontal red 5x7 card. You'll also need a 4 1/2 x 6 1/2 java (dark brown) mat, and a 4 1/4 x 6 1/4 pink snowflake mat. 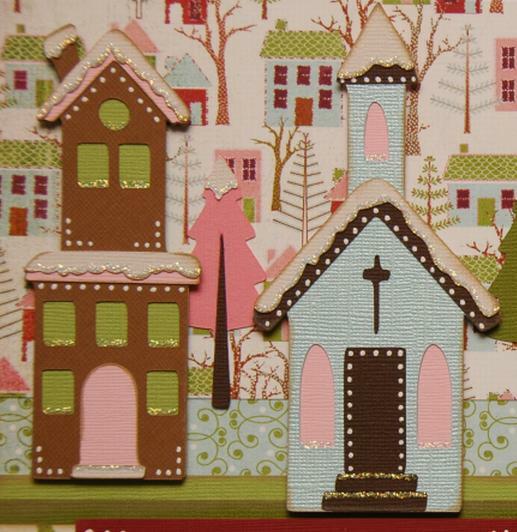 This pink snowflake paper is from the JoAnn's Peppermint Forest stack - yum! Ink the pink mat and glue to the java mat. 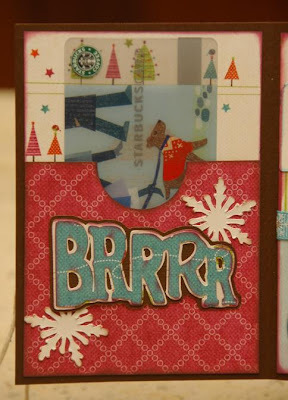 Wrap your ribbon around this pink/java combo, and then glue this to the red card. 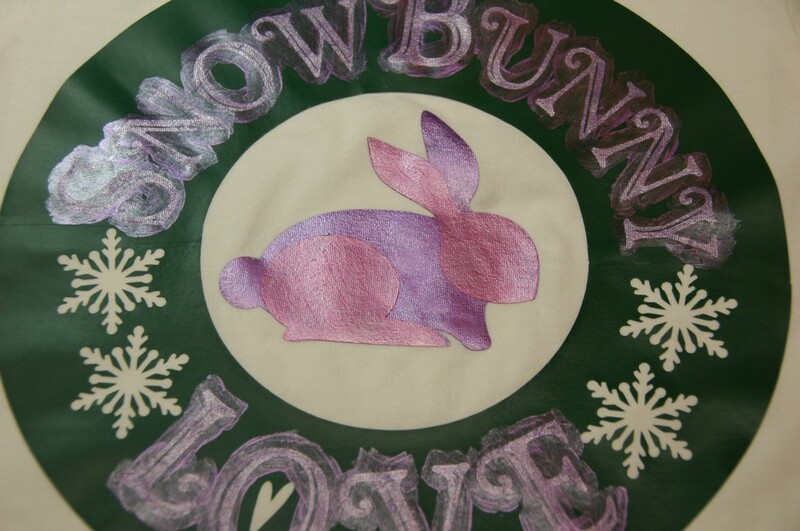 I also inked the red scalloped circle, pink letters of title, white snowflakes, dog, hat and scarf. Careful - inking is addictive! I cut the scalloped circles from the Winter Woodland cart at 3 3/4" (pg 32 in booklet). The lighter scalloped circle is Core'dinations cardstock, so I embossed it in my Cuttlebug with the snowflakes embossing folder and then lightly sanded it til the pink core popped through - how cool is that? 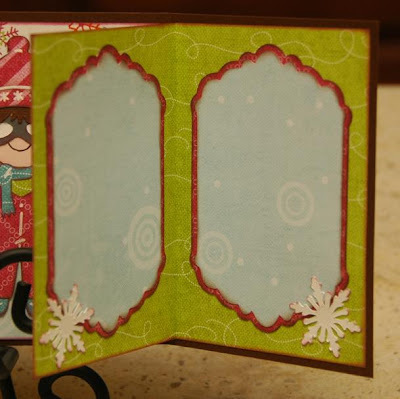 Attach the layered scalloped circles to the card. Also using the WW cart, I cut my snowflakes at 1 1/2" (pg 33-35), and the "Let it Snow" title at 1 3/4" (pg 62). This title is layered with java as the shadow and pink snowflakes for the top. Now for the Everyday Paper Dolls cartridge. I cut the doggie out at 2 1/4" (pg 74). I cut a java base using the Shadow/Blackout feature, and then a lighter brown doggie to layer on top of that, off-setting it just a bit. The scarf is also cut at 2 1/4", and then the hat is cut at 3" (both on pg 36). Ink these and glue to the doggie, and then use pop dots to attach him to the card. Finally, use a Signo Uniball white gel pen to go over the accent lines on the doggie and add some white dots to the corners of the red card. Oh, and don't forget your pink rhinestones on the snowflakes. Ta-da! All finished! Are you ready for my first video??? Ok, be warned - it's a little rusty. At one point you can hear my dog drinking water in the background, and later I refer to rhinestones as "brads". (I swear I know the difference.) Oh, the pressure. Hope you like it anyway!!! Thanks for stopping by my blog. Be sure to check back tomorrow for a Home Decor project!! Finally! I've had tons of requests, so I've finally made more of these Wild About You book kits. You'll need the Expression and Animal Kingdom cart (+ a font cart). 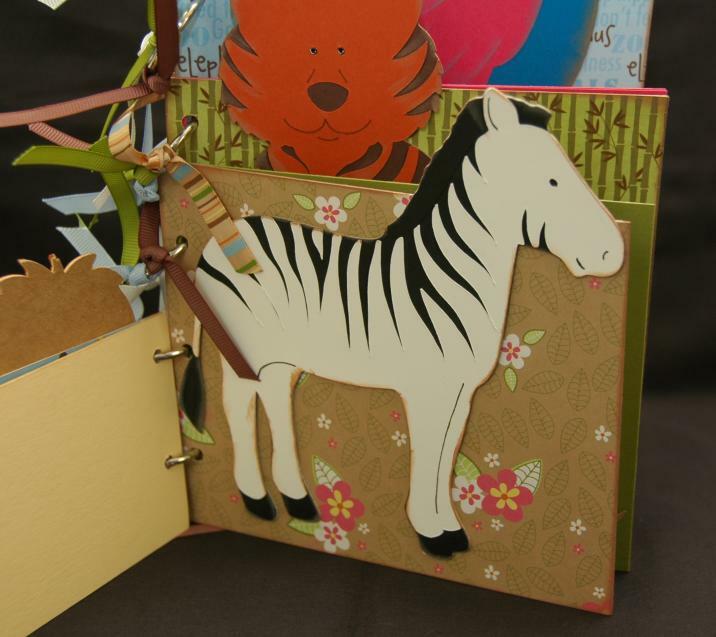 The kit is $25, and includes all materials you'll need, plus the book pages are pre-cut for you. And you'll also get my killer directions with Cricut Cut Chart. This shows you line by line exactly what you need to cut on your bug with all of the settings. Shipping is available, and depends on where you live, but tends to run $7-$9 in the US. I also have several other kits available, and can combine shipping. You can email me at moniquegriffith@yahoo.com to order or get more information. Have a wild and crazy day!!! Alrighty, so I'm not always the most punctual person in the room. Here's a look at the projects I'll be teaching at this week's Christmas Vinyl Decor class on Thursday, November 12th here at my home in Rocklin, CA. The class is nearly full, but there are still 3 or 4 openings. 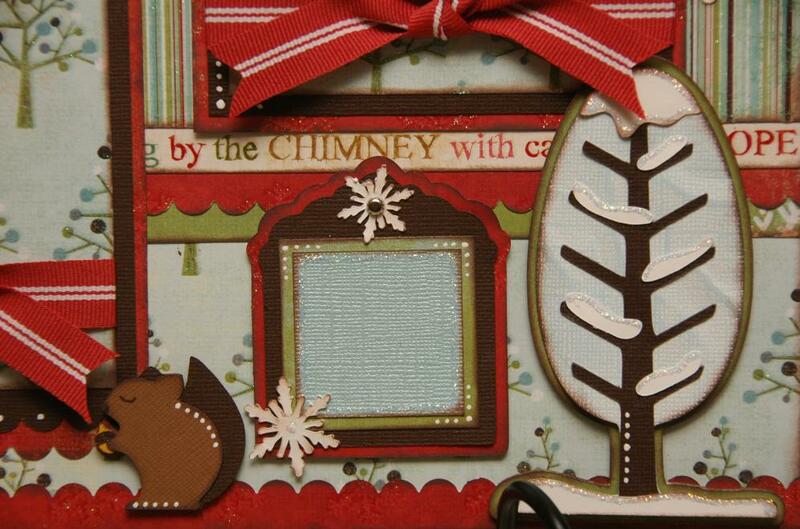 All of these projects were made with the Christmas solutions cartridge, which is gorgeous and elegant. 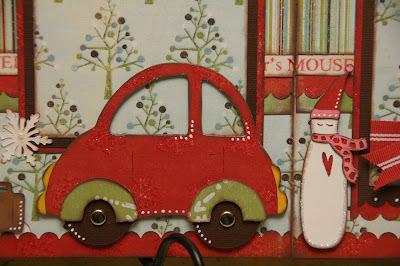 But I'm a total Christmas nut, so I just have to gush about all of the Christmas and Winter carts that Provo Craft has put out. 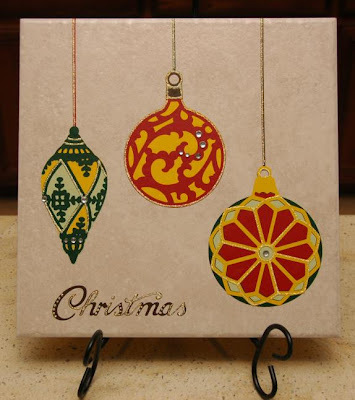 I used vinyl to create the decorative tile, as well as touches of Stickles and rhinestones. You could display this tile on a sofa table or shelf, and switch it out with a new one every month or season - how fun would that be?!?! And then the Santa's Sleigh will be a project to cut out in the class and then take home to put it on your wall. It would be fabulous over a fireplace or doorway, wouldn't it? If you're local and would like to sign up for this last-minute class, you can email me at moniquegriffith@yahoo.com. Shamrocks4me - I'm unable to reach her, so if anyone knows who she is, please either tell her to contact me, or let me know how to get in touch with her. Thanks! Congratulations to each of you. I'll attempt to contact you, but if I'm unable to reach you, please email me at moniquegriffith@yahoo.com and let me know if you'd like the Boo Crew Halloween Layout kit which requires the Paper Doll Dress Up cart, or if you'd prefer the Forever Adore Layout kit which requires the Home Decor solutions cart. I'll also need your shipping address. Congrats again!!!! And a big thank you to all who entered!! !